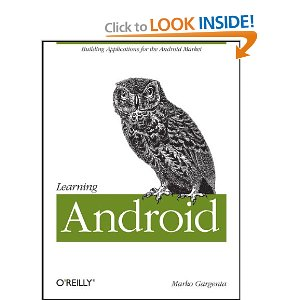 The first book in the list is Learning Android by Marko Gargenta, released by O'Reilly in March 2011. 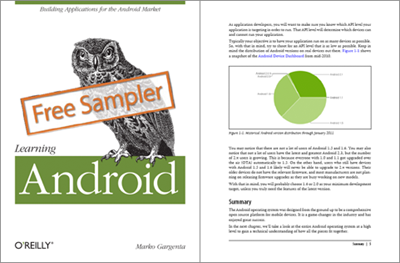 The book starts from the basics and goes into details of the Android user interface, preferences, Intents, options, file system, services, database, lists, adapters, broadcast receivers and listeners, content providers, system services, and even the NDK (native development kit for C++ development). The learning approach chosen in this book is the best one I can personally think of - you will be building a Twitter-like Android application from the ground up, adding features along the way in each chapter. The book is valued at $35, though it's currently on sale on Amazon for $21.77. Grab the sampler, which includes the full table of contents and the first few pages from here. Want to build apps for Android devices? This book is the perfect way to master the fundamentals. Written by an expert who's taught this mobile platform to hundreds of developers in large organizations, this gentle introduction shows experienced object-oriented programmers how to use Android’s basic building blocks to create user interfaces, store data, connect to the network, and more. You'll build a Twitter-like application throughout the course of this book, adding new features with each chapter. Along the way, you'll also create your own toolbox of code patterns to help you program any type of Android application with ease. Some of you have been asking for a contest that does not involve social media, and this time we'll give you just that. To enter the giveaway, just leave a comment here in this post (not on Facebook) and provide a compelling reason why you should be the one to win this book. The winner will be selected by the Android Police and O'Reilly panel after May 31st 11:59 p.m. PT and notified via email. Make sure you use your real email in the comment, as that's what we'll use to contact the winner. Oh, and I try to fight for this every time we do a giveaway, so I'm glad to report that this giveaway is open to anyone in the world! Good luck, may the best aspiring developer win!